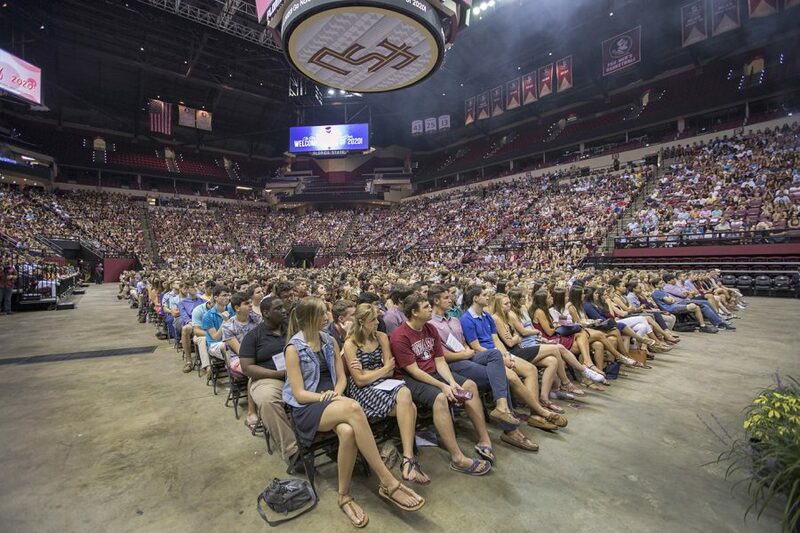 Most of Florida State’s 6,200 incoming students attended the hour-long ceremony, joined by their friends and family. Tallahassee Mayor Andrew Gillum at Florida State University New Student Convocation Sunday, Aug. 28, 2016. 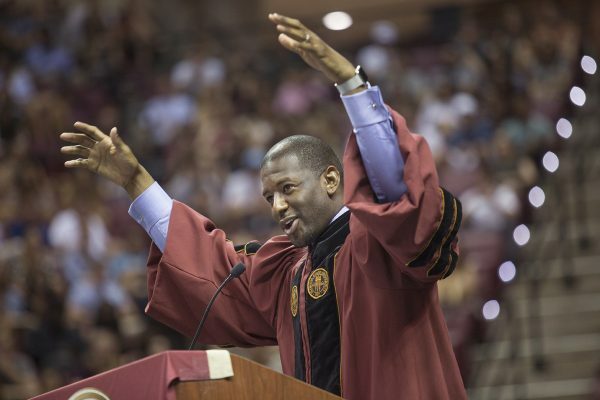 Tallahassee Mayor Andrew Gillum addressed the incoming class at Florida State University’s New Student Convocation Sunday Aug. 28, at the Donald L. Tucker Civic Center. Current Student Body President Nathan Molina introduced the mayor and reminded the new students to take pride in their university, while Gillum advised them that college isn’t just about the education they will receive in the classroom. “It’s not just about being good academically, it’s about being good people,” Gillum said. 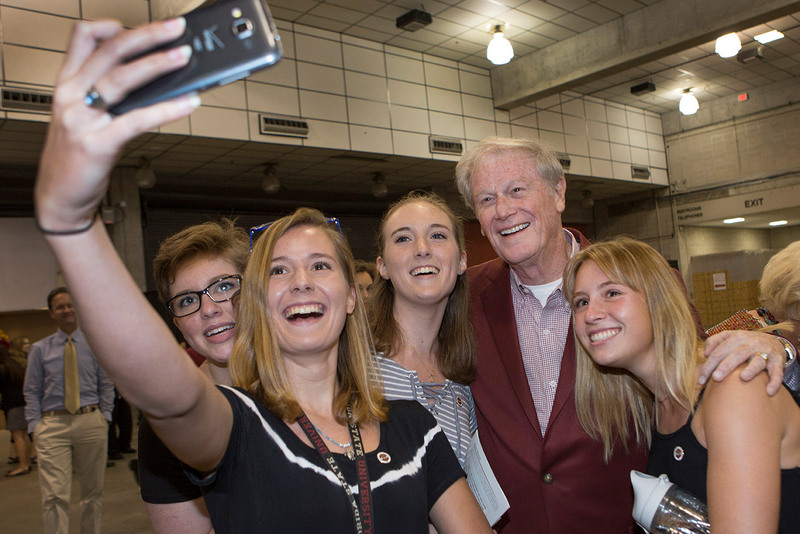 Florida State University President John Thrasher presided over the ceremony and welcomed the Class of 2020, one of the most diverse in the university’s history. 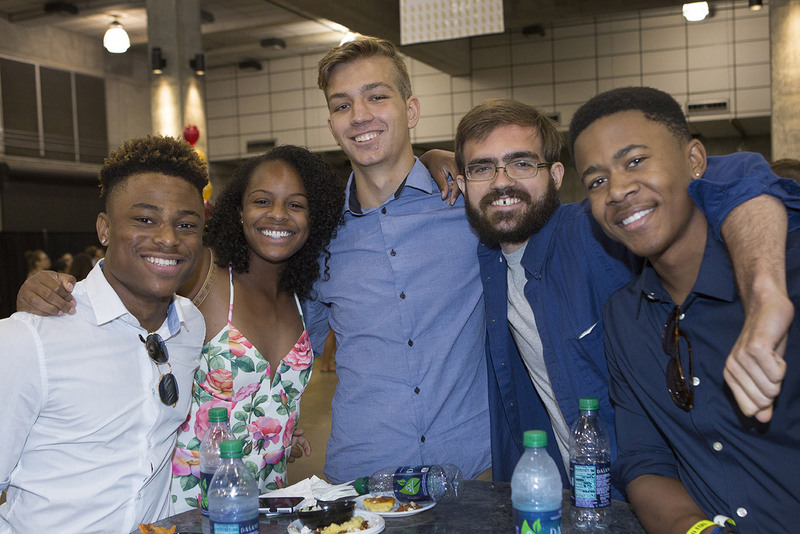 The annual event officially welcomes first-year students into the FSU community of scholars and introduces them to the university’s values and traditions on the eve of the first day of the fall semester. 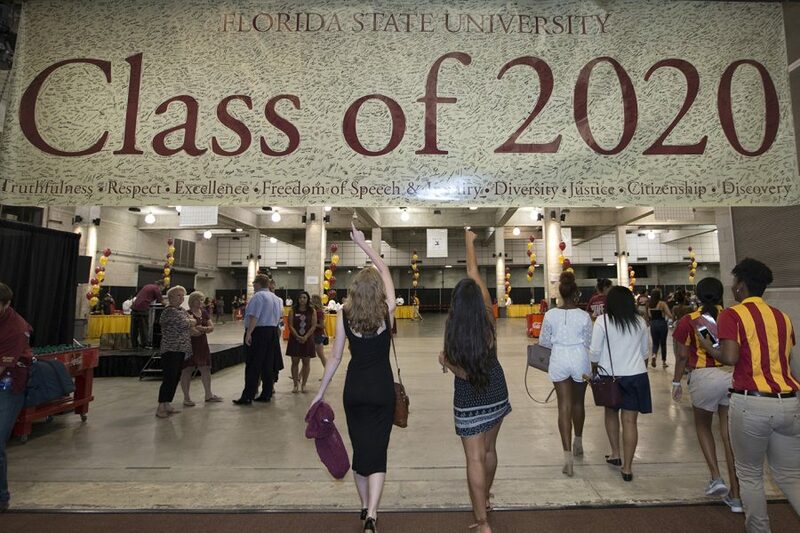 Most of Florida State’s 6,200 incoming students attended the hour-long ceremony, joined by their friends and family. The new students are among about 42,000 students who will begin classes on Monday, Aug 29. View the archived Convocation webcast. The students were excited and shared big dreams for what they will accomplish in their four years at FSU. Provost Sally McRorie encouraged students to take advantage of the academic opportunities available to them, like making one of Florida State’s award-winning faculty members a mentor. Dean of Undergraduate Studies Karen Laughlin urged students to live by the values embodied in the three torches on the university seal, Vires (strength), Artes (skill) and Mores (character). The three torches were then symbolically passed by upperclassmen to the incoming freshmen, representing the passing on of the university’s ideals from one class to the next. Blazing torch participants. (Left to Right) First row: Bryce Nichols, Eric Meincke, Sarah Munyon. Second row: Morgan Klaevermann, Andrew McMillian, David Butter. 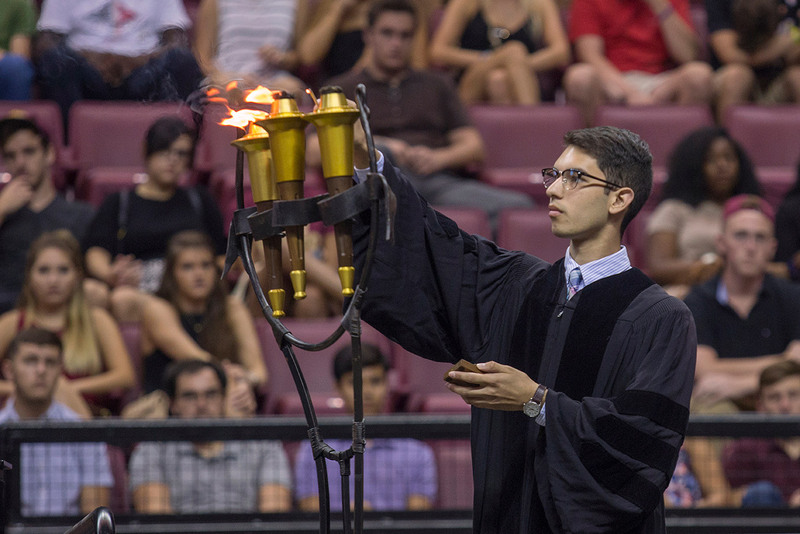 Receiving the torches were three first-year students chosen on the basis of essays they wrote about the qualities embodied in the three torches and how they connect with the history and culture of the Seminole Tribe of Florida. The participants were Morgan Klaevermann, who passed the Vires torch to Bryce Nichols, Andrew McMillian who passed the Artes torch to Eric Meincke and David Butter who passed the Mores torch to Sarah Munyon. Incoming Theatre student Emily Onimus read the essays. 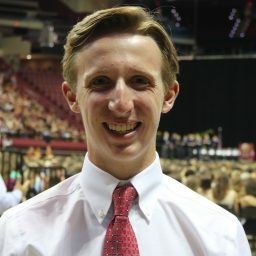 Meincke, an instrumental music education major from Little Rock, Ark., looks forward to his time at Florida State and getting a taste of independence. The freshman also anticipated going to football games and making new friends. Dean Laughlin then led the new students in reciting the Academic Honor Policy Pledge, and reminded students of the importance of integrity in learning. Vice President for Student Affairs Mary Coburn led the Class Pin Ceremony and the recitation of the university’s Seminole Creed. 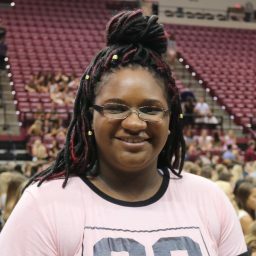 She reminded students to reflect the values of Florida State in their daily lives, like taking responsibility for themselves and respecting others. Students were taught the Alma Mater, “High o’er the Towering Pines” with assistance from College of Music Professor Kevin Fenton and first-year music student Brandon Deuber. 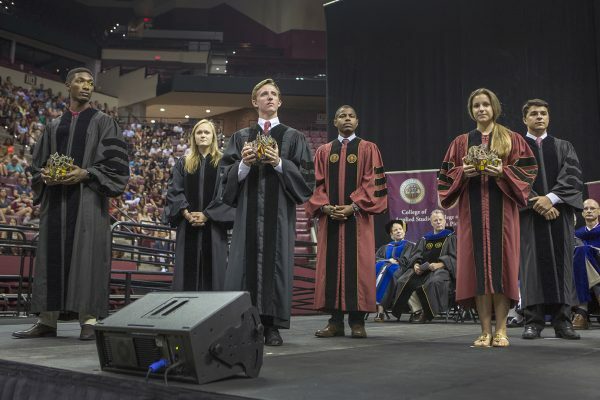 Provost McRorie challenged the students to think about how they will embody the Florida State ideal and called upon them to strive to reach their greatest potential both academically and personally. 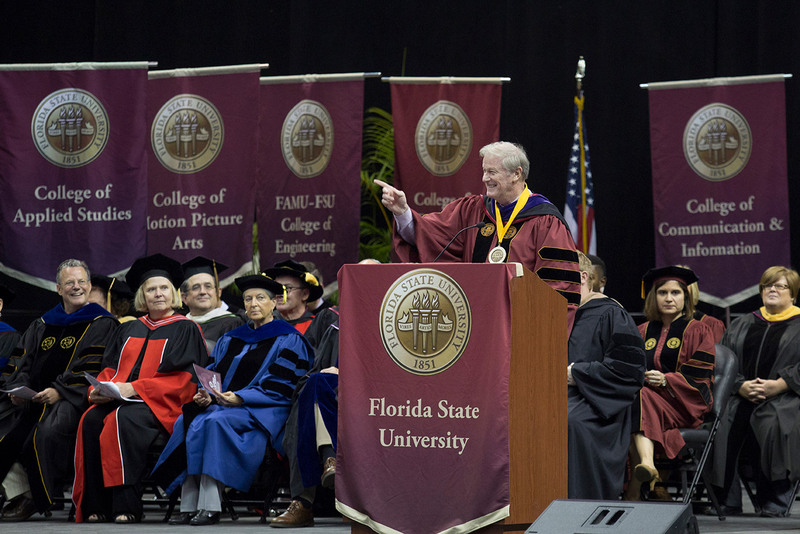 Following convocation new freshmen and transfer students joined President Thrasher and First Lady Jean Thrasher for the President’s Welcome reception at the Civic Center exhibition hall, featuring Seminole spirit and entertainment. FSU Panama City’s freshman class officially joined the FSU community at the campus’s Freshman Convocation also held Sunday. 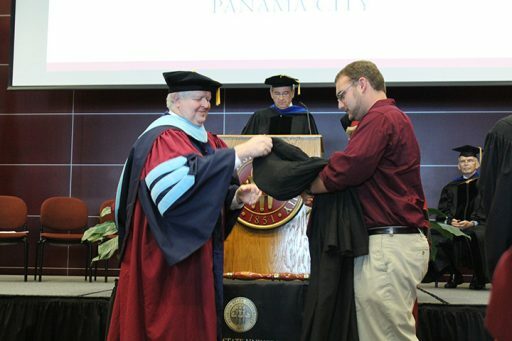 Surrounded by family, friends and faculty, students were called one by one to be robed and become part of the FSU family. 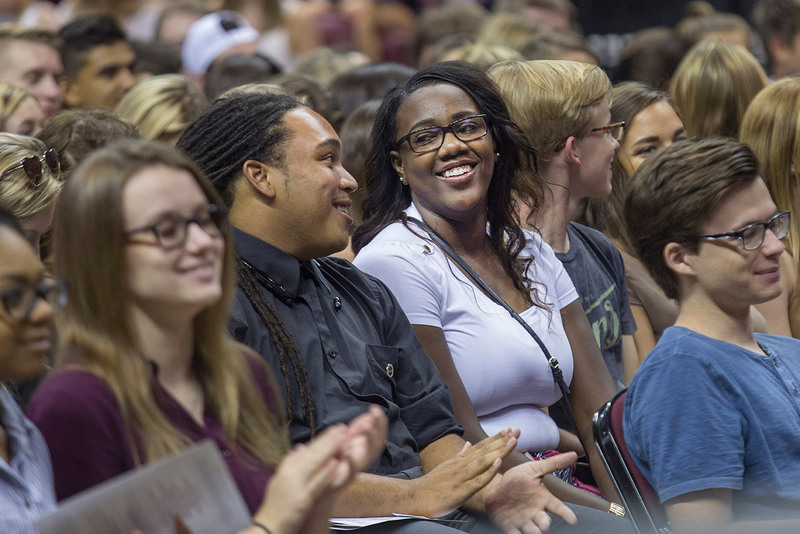 FSU Panama City’s freshman class officially joined the FSU community at the campus’s Freshman Convocation also held Sunday. FSU Panama City freshmen also learned about university history and traditions and recited the Seminole Creed. Keynote speaker Jerome Barnes, a faculty member from the electrical engineering program, stressed the significance of the academic milestone.